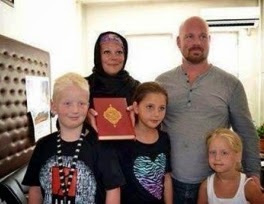 Atheist from the Norwegian town of Mugla, Marmaris is a family vacation, the mosque became a Muslim influenced by listening to the Qur'an. Family members, in tears listening to the Qur'an, he said. Nyman (34) and Frode Sigvartsen (31), a pair of children, Tuva (9), Mathies (9) and Frida (6) and came to Marmaris for the holidays. City tour of throwing into the courtyard of the Central Mosque in the family, read the Qur'an in the mosque was inspired by. Durdu'yu Hamd family in tears listening to the muezzin for 20 minutes, and then asked them to tell me Islam. At that time decided to become a Muslim Wastrup Linda Nyman said,"It was so nice reading that we found ourselves in the mosque. Sitting in a family of 20 minutes just listened and tears began to flow through our eyes. listened, I felt off of a weight off of me. Adeta relieved, and found peace. I really felt free. Islam, I am very happy that I chose. "he said. Family to him crying in the mosque to learn Islam say they want to transfer the muezzin stopped,"I read the Qur'an at the time the family had heard a witness. Tears were in his hands, I saw the opening prayer. Maybe you did not know that what you pray. Ağladıklarına hugged his wife witnessed. Then they came to us that they are atheists. reading Setup 'An inspired by the Koran have said they prefer the religion of Islam." he said. Norway at the request of the family went about the Marmaris Mugla Province Office of Mufti Hussain Assistant Mufti Small Town, "The family on holiday in Marmaris, Central Mosque visit the sedasından the meantime, inspired by the Qur'an to accept the Islamic religion and have expressed their desire to be a Muslim. Müftülüğümüze chose to come to the religion of Islam, saying that Islam adopted by bringing the word of martyrdom." he said.